The maximum power rating of the individual sockets should never be exceeded. 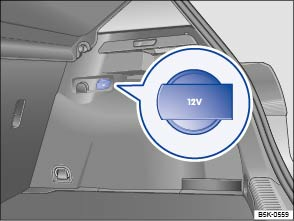 The power rating of each device is stated on its type plate. If two or more devices are connected at the same time, the overall power consumption of all connected electrical devices may never exceed 190 watts . 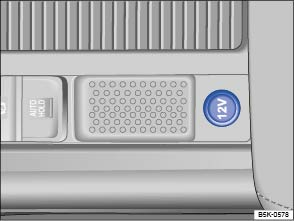 The 12-volt socket will work only when the ignition is switched on. Using electrical appliances with the engine switched off and the ignition switched on will drain the battery. Electrical consumers should therefore only be plugged into the sockets when the engine is running. To prevent damage due to voltage fluctuation, switch off any connected devices before switching the ignition or engine on or off. Under a cover in the lower section of the centre console . In the luggage compartment . Observe the operating instructions for any device that you plug into the socket. Never exceed the maximum power rating as this could damage the whole vehicle electrical system. Only use accessories that have been approved in accordance with valid guidelines concerning electromagnetic compatibility. Never feed electricity into the socket.